The Mayor of Brentwood serves as the elected chief executive of our community. Although under the council-manager form of government, which is utilized in our municipality, the Borough Manager performs the majority of administrative functions, the Mayor provides a critical check on the power of appointed public servants. The Mayor is charged with ensuring that the laws of the Borough are faithfully enforced and that policy decisions are properly and efficiently implemented. In his executive capacity, the Mayor is afforded the ability to veto any Council decision and is tasked with breaking tied legislative votes. Additionally, the Mayor is the titular head of the Police Department and is responsible for providing citizen supervision of the agency. As the Borough’s most visible representative, the Mayor holds important ceremonial powers. In addition to presiding over events, the Mayor authors proclamations to honor distinguished members of our community, which can be viewed online here. The Mayor can also authorize the closing of streets for block parties; to make application to hold such an event in your neighborhood, please complete the PDF form below. 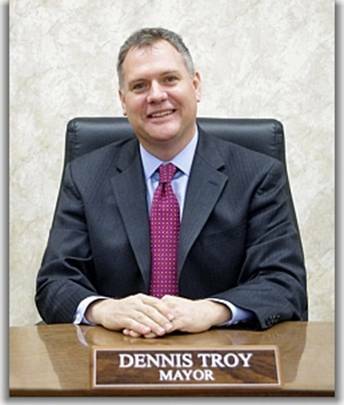 Dennis H. Troy serves as the current Mayor of Brentwood Borough. He is just the eighth individual to hold this respected and prestigious office since 1918. Mayor Troy has resided in Brentwood since his earliest years and has demonstrated an affinity for community development for his entire professional career. Dennis is a graduate of Westminister College and, soon after earning his degree in finance in 1990, he was appointed to serve the Borough as a member of its Planning Commission. He formerly worked as an aide to Allegheny County Commissioner Bob Cranmer, and he later headed the Lawrenceville Development Corporation. Dennis helped to spearhead the use of tax increment financing to transform the aging Brentwood-Whitehall Shopping Center into the revitalized Brentwood Towne Square. Since 2003, he has worked as a consultant to real estate firms, first as president of Houston Harbaugh Services and currently as principal of DTI Development.